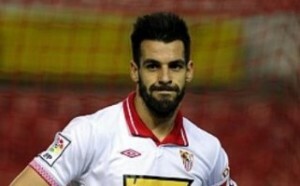 Reports are out claiming that Manchester City are believed to be in talks with Sevilla striker Alvaro Negredo. The 27-year old Spanish international has emerged as a target for both City and Tottenham but neither club are yet to make an official offer for his services. Sevilla president Jose Maria del Nido said : “Sevilla have an asking price for Negredo and if it isn’t met, he will play for Sevilla next season. Tomorrow he will sleep in Seville and then he will start training with the team again,”. However, Sky Sports suggests that City and Sevilla are in negotiations regarding Negredo who had emerged as a strong target for Atletico Madrid before they conceded defeat to the Eastlands outfit.